(W) Mark Waid (A) Peter Krause The secrets of the malicious alien race The Vespa are revealed. Earth hangs in the balance as their clandestine relationship with a fallen Paradigm member comes to the forefront. The Paradigm's past comes back to haunt them, Plutonian meets his match, and the fate of the world will never be the same! A new story arc kicks off here! 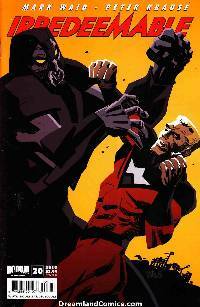 Covers by Dan Panosian and Paul Renaud.